Are the snap rings only available at a Ford service Center? If the servo does't come out, do I still need to worry about the OD band? Even if I compress the servo? Do I need to replace the valve body gaskets? Last edited by pyro383; 07-23-2018 at 02:10 PM. If you compress the servo to just replace the snap ring then you don't have to mess with the band. Always replace any paper gasket you unmate from any surface it has been against for any extended period of time. They become brittle and stick to surfaces. Very inexpensive insurance. Well after tearing it apart twice and some valuable help from MLD and Darrin its finally fixed. As MLD stated I forgot to engage the OD band onto the point of the OD Servo shaft. Since I had problems with it I figure I would take some pics for other people to reference. 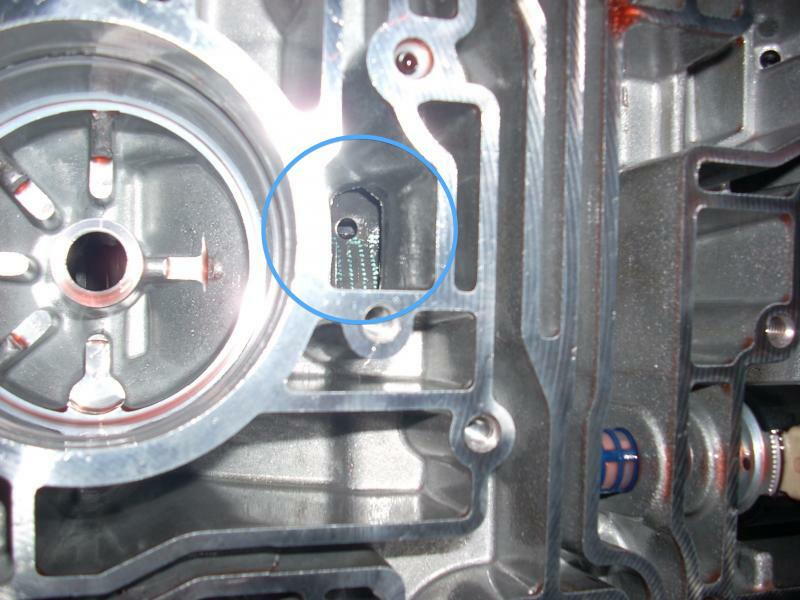 This pic shows the access hole to the overdrive band. You can see the small hole in the band itself. This is where I used a pic to slide the band toward the servo. This pic shows where the detent or slot of the overdrive band is. You can't see it but I have the pic in the hole of the overdrive band pushing it over. This is where you have to be able to slide the band over, hold it, and try to raise the servo into position to catch the band detent. It took a couple of trys but eventually got it. Slapped everything back together and I now have overdrive again. Thanks for everyones help. 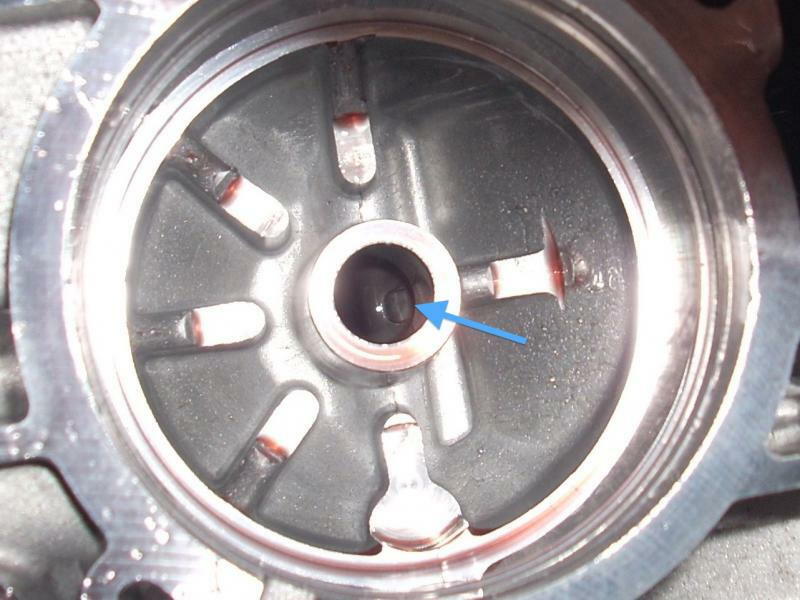 It the blue arrow the position it must be in so the top of the servo which has the point goes into the hole? I put everything back together or so I thought. I lost all gears. I need help because I’m stuck at a campground with a trailer. Yes its the 3rd hole on the right i know it has a spring above it but what holds that part up when the valve body is on?? Where the piston sets it seems like there are 2 possible seats for the ring. I set mine the deeper one as I remember it. Once I added more fluid I felt more comfortable in going for a test drive, the gears are back BUT I’m still having the OD problem also if at a dead stop and give it gas the rpms go up a bit and then it engages to go. So to clarify I didn’t have a broken ring but I removed it anyways. Reset the band and reinstall the piston and a new ring clip. If I can get it to a shop before hand, any direction I can give them? Last edited by pyro383; 07-25-2018 at 01:09 PM. Sorry it took a few to reply. Didn't see the posts until just now. I suspect that you don't have overdrive because there is something still in the valve body. Did you replace the valve body gasket? Any chance you accidentally folded the gasket while installing it? On fluid level, people misread that all the time. They try and read it like they do the dipstick for their engine oil and that won't work. Check the fluid as follows. In park with the engine running. If this is on a fresh refill then do this after the vehicle has been either driven or all gears have been engaged by moving the shifter into each position and revving the engine slightly where you can feel each position actually engage and pull. If this is just to check on a vehicle that has been in service, then it's good to check. What you do is pull the dipstick and wipe it off. Reinsert the dipstick, let it sit for a second and then pull it back out to check it. You are looking for the bottom of the lowest dry mark. You are NOT looking at the top of the fluid level on the stick because that isn't the fluid level. The highest mark is splash in the pan. Remember that you are checking this with the engine running. That fluid is moving around unlike engine oil when you check it. Also remember that there can't be a dry spot if the dipstick is immersed. Repeat maybe 3 times to make sure you find the bottom of the lowest dry spot on the stick. That is your fluid level. pyro, make sure your fluid is full. Thanks for the response. I got the fluid level where it was needed. I brought it to the shop and they are investigating. They read the data. Not torque converter. They believe it’s a solenoid. I gave them new gaskets to put on also. Im going to bump this thread with another success story... I found a good youtube video explaining the problem and the fix, and thought I had it. I had flipped the valve body upside down and gave it a shake to be sure any bits of the C-clip were out. Only counted 7 check *****, and like a previous poster here I found the last one worn down to half size and wedged into the separator plate. Reassembled with all new parts and still didnt have OD. Found this thread while looking for other issues it might be and decided to open it again to look for any bits I didnt get out. Sure enough, there was a tiny piece wedged deep into the OD valve right where the original poster here said it would be. It's amazing how a tiny 3mm piece of metal can screw up so much. At least the second go-around went quick. Had it apart and back together in under 90 minutes. Thanks to all here who contribute. Find all posts by who? I recently had the broken snap ring issue....got it fixed but when i pulled the valve body off a couple things fell out. on the passenger side rear there's a part that resembles a thermostat and then a spring on top. my question is what holds this up in the trans case? did i lose a spring that should be between the thermostat looking thing and valve body? Its the linkage from the shifter down into the transmision. You dont have it hooked back up correct. Take a breath and take it apart again and now make sure the the linkage down in the transmission is hooked back up correctly. You will know its right when you can move the shifter correctly and it moves into neutral and each gear correctly as indicated. I had the same issue and had to take mine apart again. Its frustrating, but you are almost there and you will get it figured out. Last edited by KC8FLB; 04-12-2019 at 07:18 PM.